I have the honor of again teaching our undergraduate statistics course in the School of Education, better known here as EDUC 4716 Basic Statistical Methods. Perhaps the most interesting thing about the course is that it's not required for any education programs, minors, or certificates. Instead, the course attracts students largely from the Department of Speech, Language, and Hearing Sciences (who don't need it to graduate, but do need it to apply to grad school or, more recently, to get certified) and sociology majors. So how does this course end up in the School of Ed? Probably due to the legacy we have in quantitative methods, thanks to people like Robert Linn, Gene Glass, Lorrie Shepard, and now faculty like Derek Briggs and Greg Camilli. Somehow all of their hard work and success filters down and gives a relative stats-hack like me a chance to teach undergrads. Many of my students are upperclassmen and have spent much of their college experience avoiding math courses. In fact, on last year's FCQ (Faculty Course Questionnaire) my students' average rating for the item "Personal interest in this subject prior to enrollment" was a 1.8 out of 6 -- a response the university tells me is at the 0th percentile across campus. I like to think of this as a great opportunity in a "nowhere to go but up" kind of way, a chance for me to change the way students think of mathematics and see themselves as mathematical beings. Then again, it's hard to make big changes in only 15 class meetings of 2.5 hours each. If I'm going to make a difference, class has to get off to a solid start. 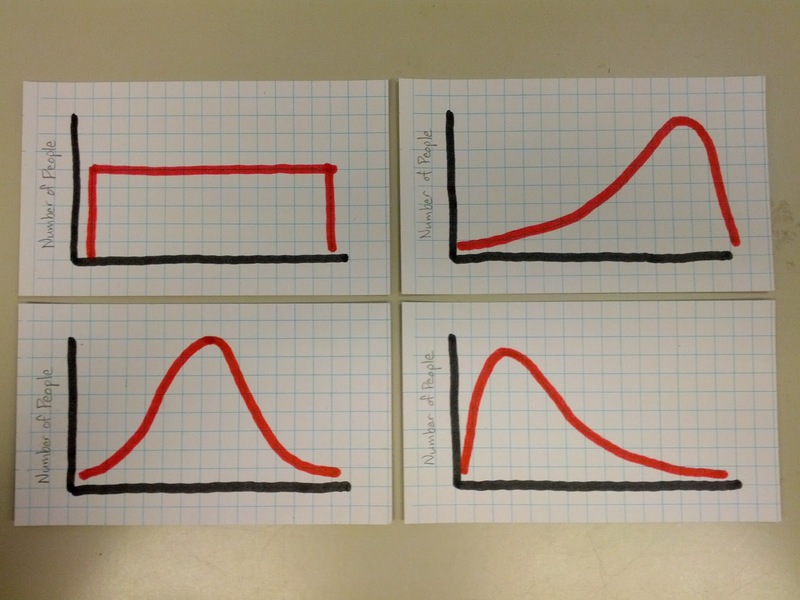 Four common distributions, clockwise from top left: normal, left skewed, right skewed, and normal. 14 pieces for 14 students. Note on the bottom I've provided the hints A, B, C, and D.
It took my class less than 3-4 minutes to find their groups and then I gave them another 3-4 minutes to discuss what their graph shape might describe. As a class, I had each group share their ideas and then we discussed them. 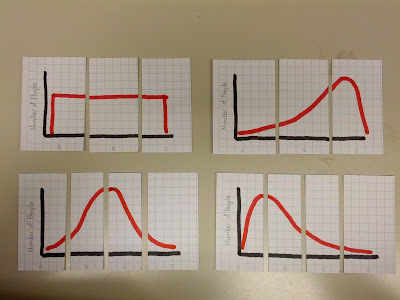 Not everybody agreed initially about which shape matched which description, which led into important comments about how we might think about unbiased sampling of students and imagining different scales and labels along the horizontal axes. If you have a few more students, cut more slices. If you want to use this for Algebra 1, you can make graphs that describe things like, "Toni walked to the bus stop at 2 mph, rode the bus at 30 mph to the bike shop, then rode a bike back home at 12 mph." Such an activity begins CPM's Algebra Connections and was the inspiration for my activity. If you want to use this for Algebra 2 or higher, you can use graphs of functions that students will become familiar with (parabolas, cubics, hyperbolas, etc.). I don't think it's worth fretting over vocabulary at this point -- just give students an opportunity to think about how the functions behave and what phenomena they could possibly model. Thanks, Cindy. 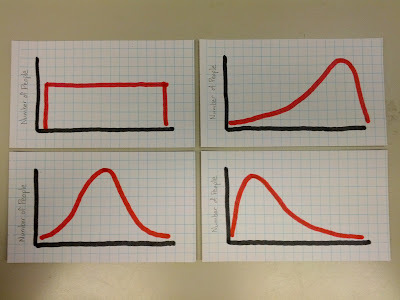 The CPM activity I used in the past had students create their own story to go with the graph. I think that would work better for Algebra 1 than it might for statistics since I really wanted my graphs to represent a distribution and not something else. 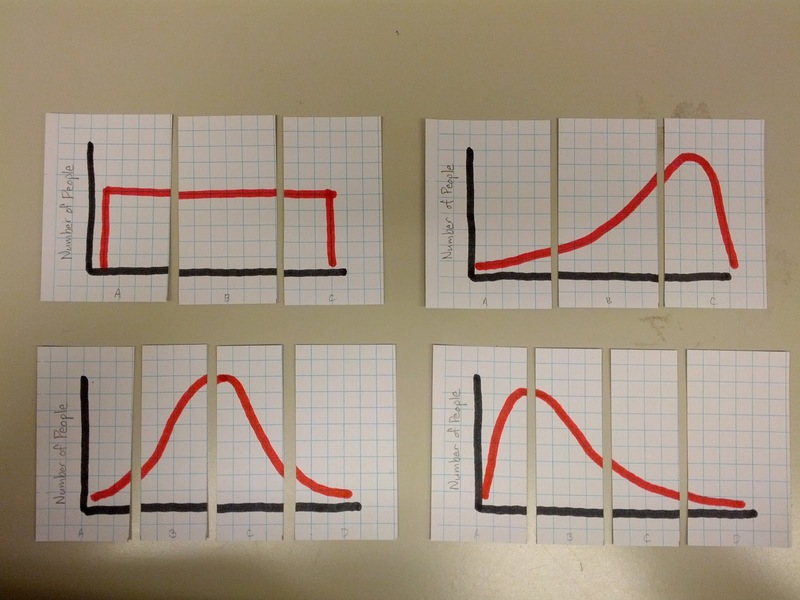 You might also want to check out Dan Meyer's Graphing Stories post for even more ideas.